London Baroudeurs recently found themselves guests of the august and venerable Anglo-Omani Society, in a grand townhouse just off London’s Piccadilly. We were there to learn about the 2016 Tour of Oman from its General Director of Information and External Relations, Mr Saif Subaa Al Rashidi; and to meet the Belgian friend he’d brought along. The Tour of Oman joined the UCI Asia calendar in 2010 as a 2.HC 6 day stage race. Fabian Cancellara won it that year, and the appeal of the Tour as an ideal early season-sharpener together with guaranteed sunshine and great roads has attracted big names to the peloton in each edition since. Chris Froome chose Oman to begin his season in 2013 and 2014, taking the leader’s red jersey on both occasions, with queen stage of Green Mountain (like a ‘compact version of La Planche de Belles Filles’ – Cycling Weekly) 5.7km at an average gradient of 10.5% proving decisive. Whilst we sat in comfortable chairs amongst London’s re-patriated explorers and Omani aficionados , Mr Al Rashidi outlined the infrastructure of the Tour and the impact it is having on tourism into Oman, and enthusiasm for cycling in the country itself. Unlike certain ill-fated newcomers to the UCI calendar, the crowds who’ve come out to watch the peloton flash by are growing in strength and number, with children and families well represented in the faces along the route and at the stage finishes, as well as cycling fans from near and far. And that other special guest? 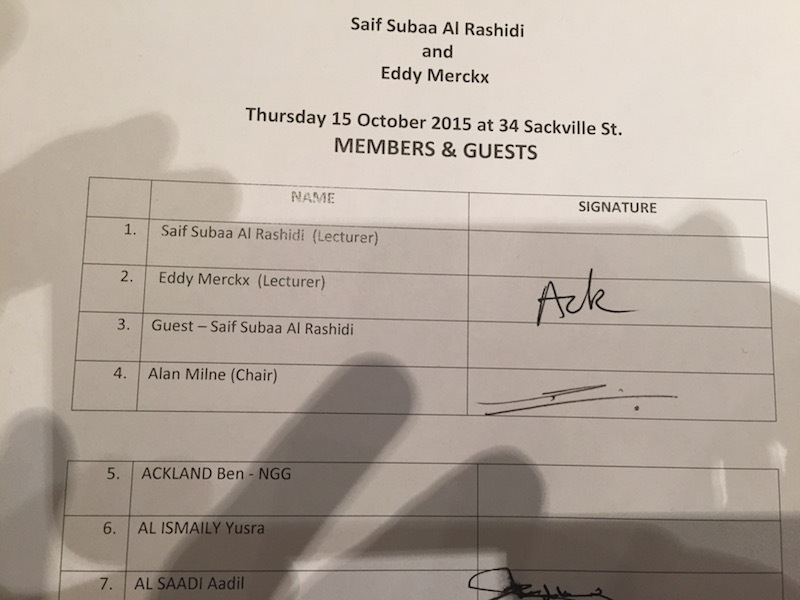 The Race Director at the Tour of Oman is a certain Mr Eddy Merckx, who needs no introduction here. Suffice it to say, his presence was enough to cause one overawed Baroudeur to forget who he was when signing in to the event, adding his own signature next to Merckx’s name in a giddy homage-accident. 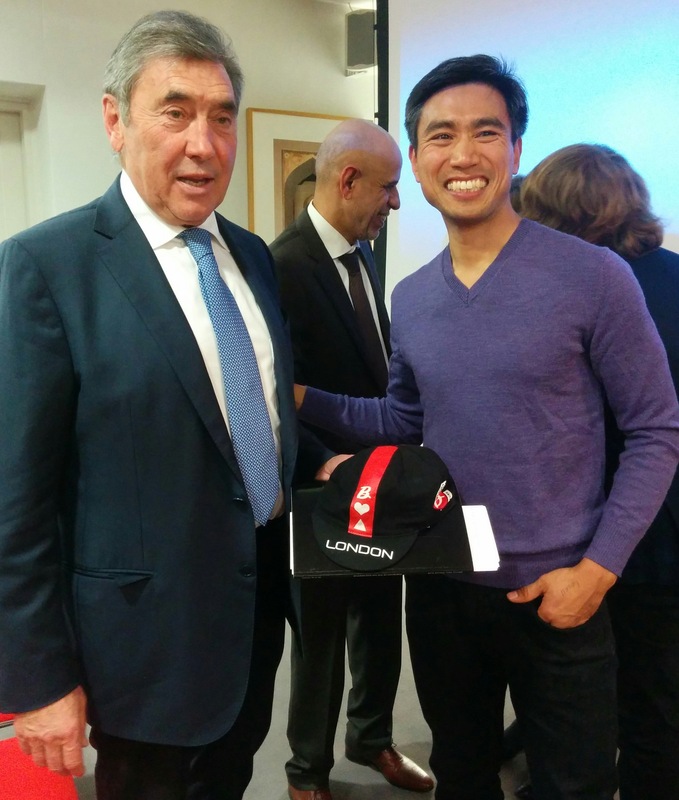 Lowell presented the great man with a token of our esteem, a Baroudeur cap for being the most barouderus of them all. 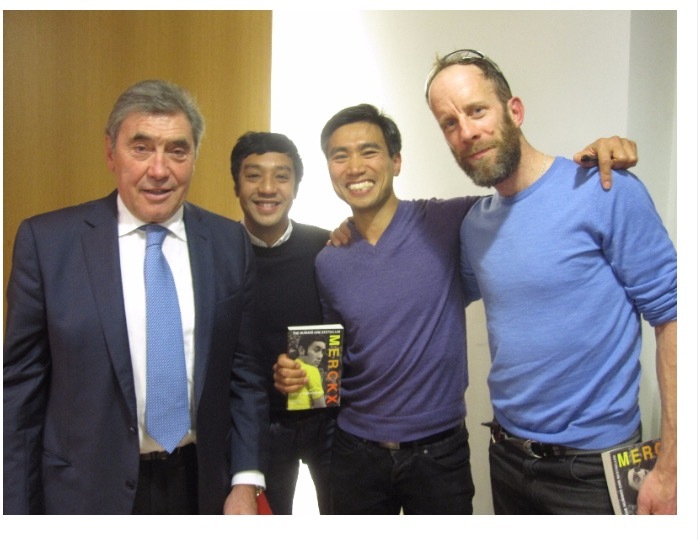 Merckx graciously received this gift and signed copies of his biography before posing for photos. 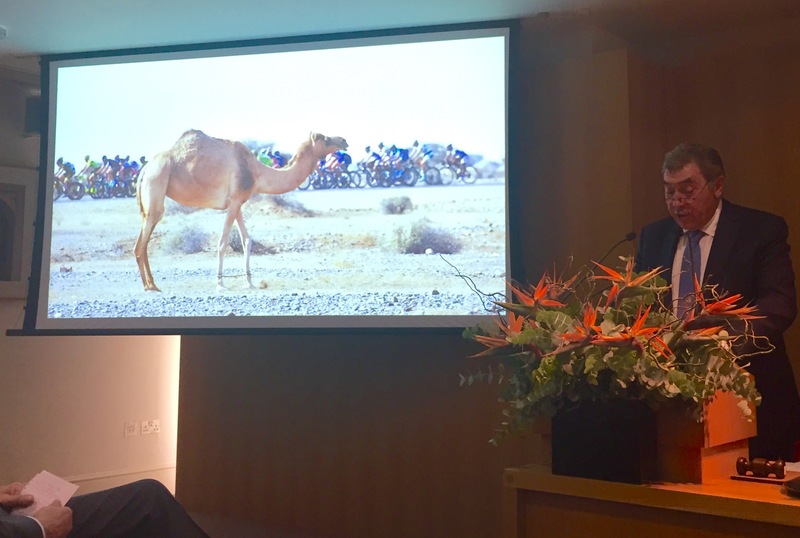 Thanks to the Anglo-Omani Society for having us, to Mr Saif Subaa Al Rashidi for his warm invitation to visit his beautiful country and to Eddy Merckx, for, well, too many things to list here. We’ll see you in Oman.